This past weekend as I visited the 10th East Austin Studio Tour (E.A.S.T. ), where artist studios, art galleries, and various spaces in the area allow for a chance for the public to get a behind-the-scenes look at working artists’ spaces and processes, I reflected on what an amazing opportunity a yearly event like this is to someone trying to add extra style to their home. Visitors can help support local artist by making a purchase, see where artists work, and visit with artists about their process. Spectators have a chance to own a piece from an artist that may have a local twist or live in their own neighborhood with variety of different styles and techniques to pick from. Whether looking to decorate in screen printing from Kong Screen Printing on Cesar Chavez or planning on turning your ideas into intricate metal pieces with help from Brad Foster of Metalshop Studio, there is a resource for most every situation. Various artsy furniture designs from providers like RAD Furniture, a design and fabrication shop founded by 2010 by The University of Texas’ Master of Architecture program, or Hatch Workshop, inspired by people a group of friends met and things they have found. Paul Clarence Oglesby, Jr. creates simple forms of concrete sculptures that can be multiplied to produce rhythm and movement. He transforms natural heaviness of the material into an elegant form. Ron Telposky from Wondering Glass Studio uses a hot torch powered by oxygen and propane to melt and shape borosilicate glass to create colorful and functional contemporary glass pieces like perfume bottles, vases, or decorative ornaments. Personal favorites were found at the studio in 1404 Canterbury St with Liliana Wilson Art, acrylic paintings and drawings that lure the viewer to a place’s hidden mystical tales untold and lives to be lived while Peter Ortiz shares his culturally mystical colorful pieces. 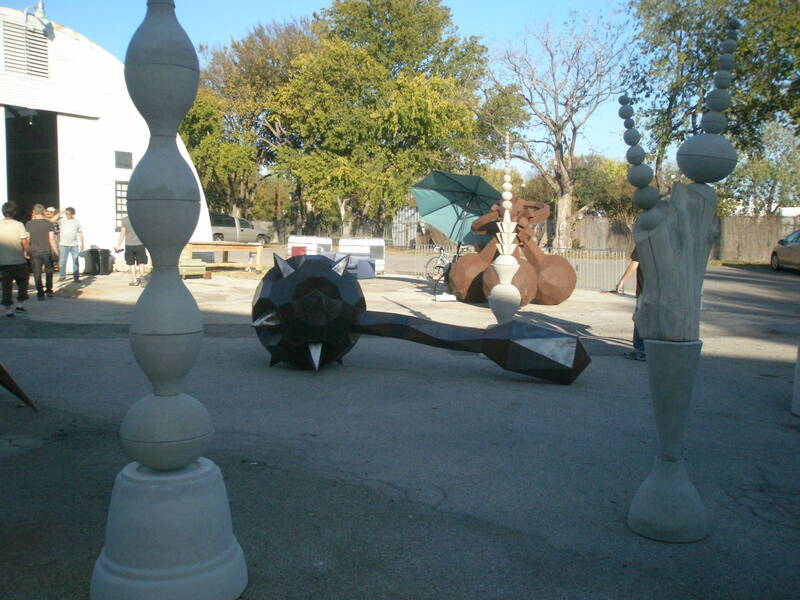 Whether looking for Austin talent on canvas, cement, to metal pieces, E.A.S.T. is sure to fulfill any sense of style with an added bit of local flair. The event catalog is available for free throughout Austin through all 22 branches of the Austin Public Library and at Big Medium through the end of the tour. E.A.S.T. has been extended for one more weekend until Nov 20, 2011 with over 300 artist to choose from so don’t miss out.